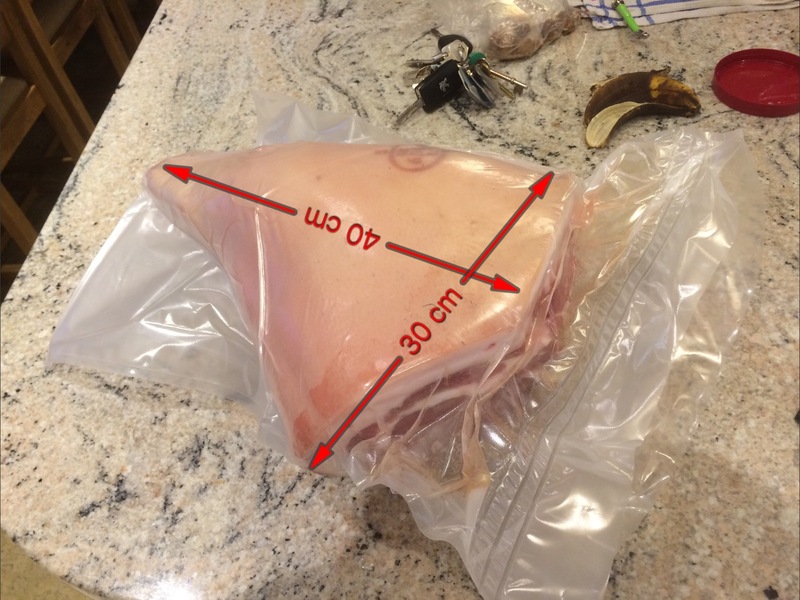 This is a recipe to take a leg of pork and turn it into ham. 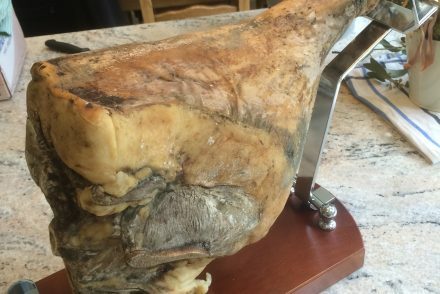 The pork is taken from the back leg of the pig. There are three stages to producing ham: brining, boiling and baking. It is based on a recipe given to me by the gentleman who breeds pigs and sells half pigs to me. This presented two challenges for me: finding a saucepan big enough to boil up and make the brine, and finding a container big enough to put the meat in and cover in brine. 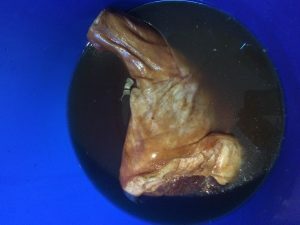 I eventually invested in a new stockpot from eBay to make the brine, and used a clean swing top bin to soak the meat in. Grind the juniper, bay, peppercorns and cloves together. Mix with all the other ingredients, bring to the boil. Allow to cool. 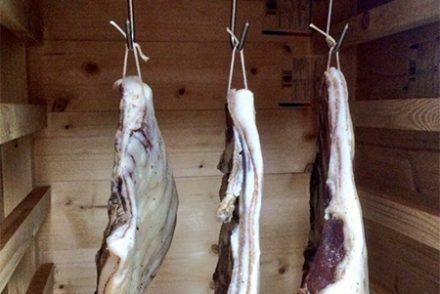 If possible, chill overnight with the meat. Place the meat in the brining container. Pour the brine over the meat. I found that I had to make up a second batch of brine to fully cover the meat. I also found that the meat floated to the surface of the brine so I weighted it down with a stainless steel (not aluminium) sauce on the top with a couple of bricks in it. Leave the meat in the brine for 4 days per kg. I left it a bit longer than this as I had to go away for a week but it didn’t seem to do any harm. Soak the meat for two days. Change the water at least twice. Logistically, this was difficult for me as my largest stock pot is too heavy to lift when filled with water. I ended up using a hose pipe to fill it, and an old length of hose to siphon water out in order to empty it. Find your largest stock pot. Add meat. Cover with water. Add onions, celery, carrots, peppercorns and herbs to taste. Simmer for two hours. Be aware that it will take some time to get this to simmering point. Taste the water. If very salty then change the water and boil for longer. Mix mustard and honey into a paste. 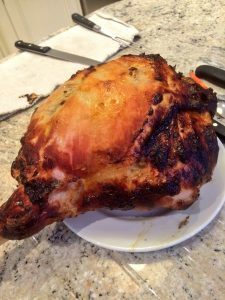 Peel away the skin of the ham to carefully leave a smooth layer of fat. Place the meat in a roasting tin and lightly score the surface fat in a rough diamond pattern to provide a “key” for the paste. Spread the paste thickly over the surface. Bake for 1-1.5 hours in a medium oven. 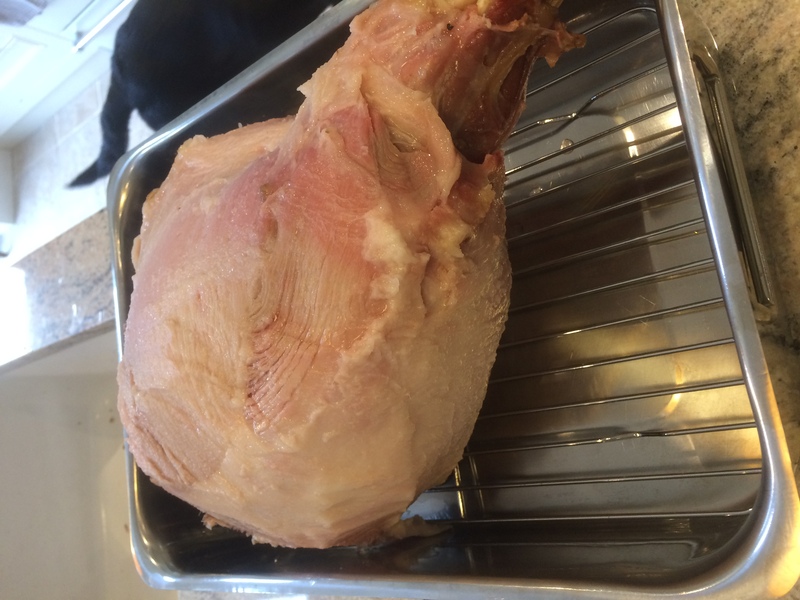 The ham is then ready for eating. Enjoy.